I drove through the fog to the top of Mount Spokane early in the morning. The summit was completely shrouded in heavy fog. It was only myself and a white supremisist (they were all over Spokane) on the summit of the mighty mountain. We struck up a conversation and when he found out I was engaged to a Japanese lady, he said the Bible forbid it. He said the Japanese were heathens and that the U.S., white anglo-saxon countries were the new chosen people. We debated for 30 minutes, quoting Bible passages. I paraphrased mine because I wasn't too well versed in Bible, but I'd been listening to Christian radio a lot by that time. Soon it was over. Spooky...I felt like Jesus tempted by Satan in the desert. 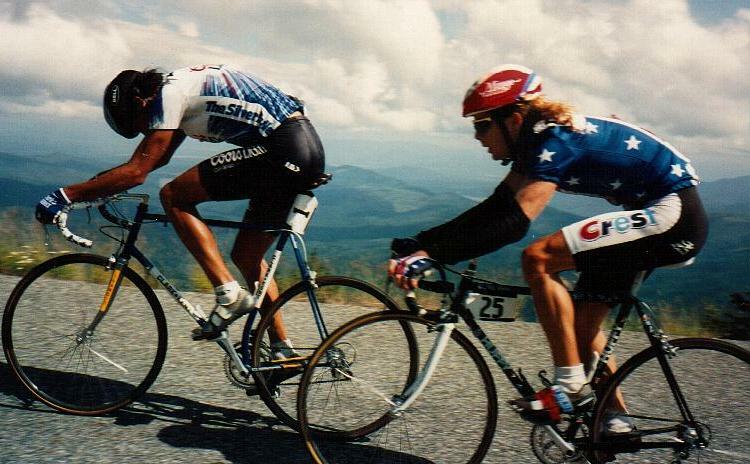 (above)Hours later, Alexi Grewal, 1984 Olympic Gold Medalist (with the number one between his legs), led Mike Engleman up Mount Spokane in the 1990 Washington Trust Classic, a stage race around Spokane. Grewal was the defending champion. I tried to talk to him before the next day's race but he was puking in an alley, so I let him have his privacy. Racing can really be very stressful. The next day I raced the Washington Trust criterium in downtown Spokane with the amateur field. And sure enough, another rider crashed in front of me, and I lost contact with the speeding pack field, just like a year before in Matsuyama, Japan. But this time I was able to catch up. Mount Spokane was a climb I did five times (after I got married Miimii forbid me to do it alone so I didn't do it much) and was probably the hardest single ride I'd ever done. The summit was at 5878 feet, and I had to climb 4000 of those in 12 miles. 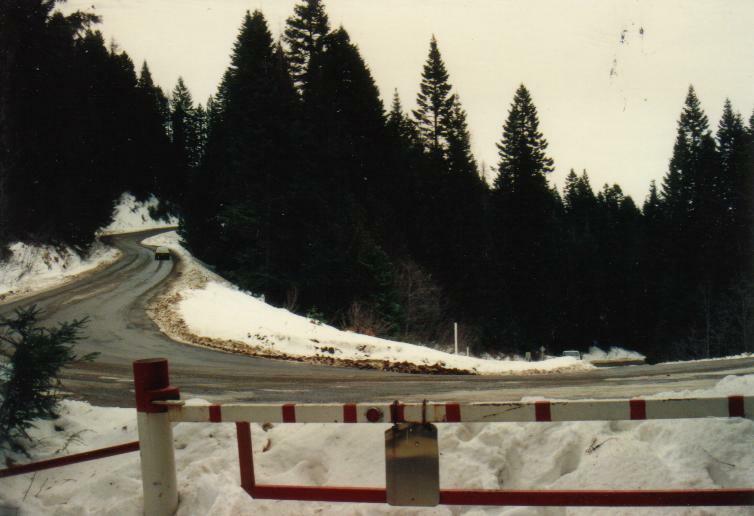 Above is a photo of just one of the switchbacks to the summit. 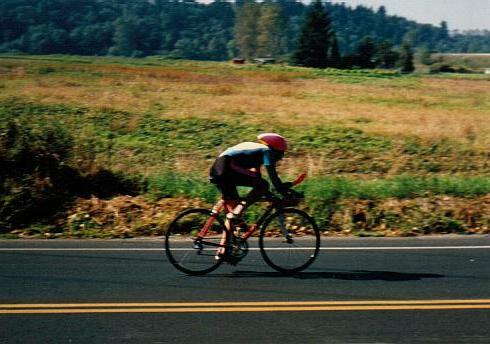 In 1991, during the Washington Trust Classic, I rode 45 miles from my apartment to the top of Mount Spokane, and hooked up with the pro-race. I finished with them, in front of the throngs of screaming fans and TV cameras. I wasn't in the race (didn't wear a race number), but I still got all the cheers, along with Alexi Grewal (gold medalist). The announcer was a little confused though, when I wasn't wearing a number. Over the public address system he said,"And let's hear it for...uhhh...who is that?" Miimii followed me up in the car and I quickly ducked inside to change before they found out who that straggler was. In 1990 I raced 22 races. I only had one win...a 10K run at Fairchild in which I beat the base commander in a head-to-head battle. He was very famous for his running prowess and I, at that time, was unknown. I also won the parent/child obstacle course with a friend's child(I didn't count that one with the 22 races). (left)I raced a ten-mile time trial in Seattle, and had my first top-ten finish. I was seventh place in this one (ten miles in 23min28sec). My friend Bob came along. They disqualified me because they said I had turned around for the return half of the race too soon (actually it was only about ten feet short). The turn-around was confusing and it was a mistake, but even with the additional time, I would've easily bagged 7th place. So...since I knew I rode the ride, for my own personal gratification, I count it.